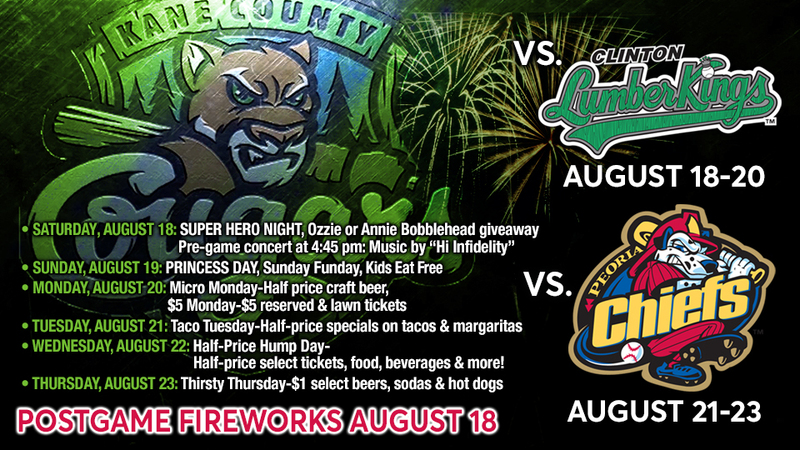 GENEVA, Ill. - The Kane County Cougars, Class-A Minor League affiliate of the Arizona Diamondbacks, welcome the Clinton LumberKings (Seattle Mariners) to town for three games followed by another three-game series against the Peoria Chiefs (St. Louis Cardinals). Tickets are available for each game during the upcoming homestand by calling 630-232-8811 or by ordering online at www.kccougars.com. • Ozzie Superhero OR Annie Villain bobblehead giveaway for the first 1,500 fans, courtesy of Northwestern Medicine - one bobblehead per person with a game ticket. • In-game entertainment by the ZOOperstars!